From the Manhattan Infidel Future Archives, January 20, 2025: Alexandria Ocasio-Cortez Sworn in as 46th President of the United States of America! Give me your money, gringo! For the first time in its racist, sexist, homophobic history, a gendered womyn of color was sworn in as President of the United States. Thousands of proud Hispanics from such far flung regions as the South Bronx and Northern Manhattan lined the Capitol building to see one of their tribe sworn in. Look I’m all for Hispanic diversity but Mexicans and Central Americans? They might bring assault knives with them. And if that happens this city will turn into a violent hellhole. I mean, more than it already is. Not that I’m implying anything racist like our predominantly black population shoot each other. I’m just saying that out of an abundance of caution we don’t want Mexicans and Central Americans in our proud and safe city. Very safe. Come and visit. Nothing will happen to you. The police chief was then tragically shot dead. Probably by a Mexican who was trying to pass as a Puerto Rican. “He was a Mexican alright” said the arresting officer. I mean, I’m color blind. All people are equal. But usually when we have Hispanic suspects and we want to know if he’s Puerto Rican or Mexican we take him to the nearest swimming pool and have him do a few laps. Mexicans are good swimmers. Probably from all that swimming across the Rio Grande. Puerto Ricans sink to the bottom. That’s how we tell. And Mexicans make better tacos of course. But that goes without saying. And with that Ms. Ocasio-Cortez was sworn in as President. She started her inauguration speech by saying a few words in her native language of Spanish. Me gustaría decir algunas palabras a los muchos mexicanos que residen en los Estados Unidos. ¡Danos tus recetas de tacos! ¿Cuánto tiempo debe negarle a sus compañeros hispanos buenas recetas de tacos? Mi administración está dedicada a la igualdad del taco. Buenas recetas de taco hoy! Buenas recetas de taco mañana! Buenas recetas de tacos para siempre! The new president then switched to her second language of English. My fellow Americans. You have nothing to fear from my socialist agenda. It will not increase our debt. Socialism is cheap. Ponder the hidden costs of capitalism. Funerals are expensive! And when I establish a single payer socialist healthcare system funerals shall be free! That is all I want to say. Oh, and if you see a Mexican with a taco detain him. Get the taco recipe from him. I don’t care what you have to do to get it. Waterboard him if you have to. Think of the hidden costs of bad taco recipes. She then thanked Americans for voting for her. President Ocasio-Cortez finished her speech by promising to visit Mexico. 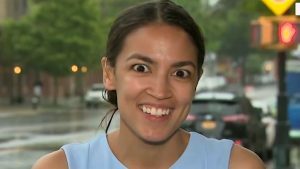 One of the best things about Ocasio is her mujerista genius for freedom. Look, I’m not saying that to somehow disparage Omarosa, who is a brave woman of color, or Stormy the Prostitute, who is also a woman of color. Do I want free tacos? Of course.